Skiers Haute Route. Guided ski tour from Chamonix to Zermatt. The iconic Skier's Haute Route from Chamonix to Zermatt dates back to 1911 and requires little introduction. Bursting with stunning mountain scenery, gnarly ascents and endless descents, the Haute Route has become an all-time classic and a must-do for serious ski tourers. Our Haute Route tour is optimised for skiers, takes in the longest and best descents and avoids valley time. We welcome skiers and telemarkers! 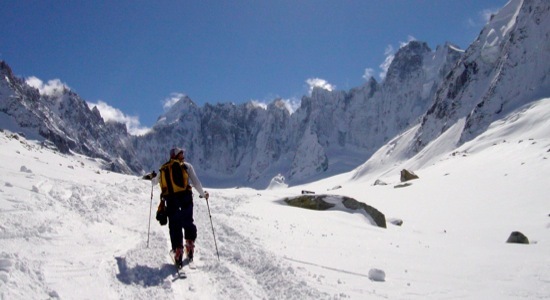 We'll warm up with a day-tour in the Chamonix valley, which will incorporate practise of crampons, ice axe and transceiver skills. There'll be plenty of nice up and down hill skiing too! Today, the tour kicks off for real. From the top of the Grands Montets we start with a great ski down to the Argentiere glacier. Our first ascent then takes us over Col du Chardonnet (or Col du Passon) and across the Trient plateau to the Trient hut. We start the day with a wonderful long descend down the Arpette valley to the lake-side village Champex. From here, we transfer to le Chable and jump on a cable car up to the Verbier ski area. It's now time for a short skin before another descend to the Prafleuri hut. If we're up for it, we'll sneak in an ascend (and descend) of the Rosablanche on the way. After a long day yesterday, today is a slightly shorter day. We start with a short skin before a long, traversing descend takes us to the spectacular Dix lake. From the lake, we climb to the Dix hut. Today we set out for an ascend of the Pigne d'Arolla - the high-point of our tour. From the summit, we have a great descend to the vignettes hut. After breakfast, it's time to check out and return to Chamonix. Suitable for off-piste skiers with some ski touring experience, good fitness and stamina and an adventurous spirit. 8 days holiday with 6 days skiing. From 4 to 6 clients with 1 certified English-speaking guide (IFMGA). Groups smaller than 4 will run if members are happy to pay a small supplement. This trip is available as a private trip with the flexibility to suit your pace and schedule. Contact us for details. Who are leading your trips? What about single travellers and single rooms? What will I carry in my rucksack? What about my additional baggage? Do you provide flights and transfers? What's the weather like? When should I go? Will the trip itinerary change? Should I choose a private or group trip? Should I choose a guided or self-guided trip?